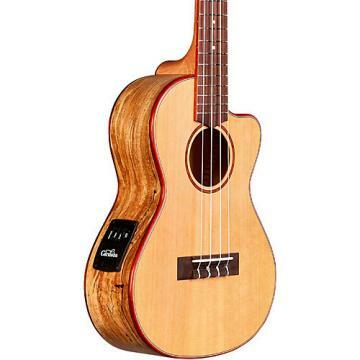 The 24C brings another exotic wood combination to Cordoba’s ukulele line, offering a unique look and a brand new tone. This concert ukulele features a solid cedar top paired with spalted maple back and sides. The outcome is a ukulele that really projects its voice, regardless of its size. Padauk binding, fingerboard binding, and a padauk rosette add a beautiful pop of red to the 24C’s striking appearance. Additional features include a rosewood bridge and fingerboard, mahogany neck, and spalted maple headstock veneer.